The Porsche 911 GT2 RS's goes from 0 to 100kph in 3.5 seconds and has a top speed of 330kph. STUTTGART -- Porsche has revealed its most powerful and arguably most extreme road-going 911 to date: the GT2 RS. The new rear-wheel-drive sports car will debut publicly at the Moscow auto show in late August and will go on sale in Europe in September with a base price of 199,500 euros. U.S. sales start in October with a sticker price of $245,000. The GT2 RS, to be built in a limited run of 500, is powered by the latest evolution of Porsche's 3.6-liter, twin-turbocharged, horizontally opposed six-cylinder engine, tuned to deliver a Le Mans-grade 620 hp. That's 90 hp more than the out-of-production 911 GT2 and 8 hp beyond the German carmaker's previously most powerful road car, the 5.7-liter, naturally aspirated V10-powered Carrera GT. The Metzger engine, named for the motor sport engineer responsible for its original design, eschews the direct injection of Porsche's newer 3.8-liter six-cylinders for an older sequential fuel-injection system, boosted by the latest BorgWarner turbochargers. Drive is channeled to lightweight, 19-inch, center-bolt, forged-alloy rear wheels via a beefed-up six-speed manual transmission and a mechanical locking differential backed up by a recalibrated stability program. With a series of weight-saving measures, including a carbon-fiber hood and interior features such as racing bucket seats, the 911 GT2 RS weights 1,370kg (3,014 pounds) 70kg less than the 3-year-old 911 GT2. 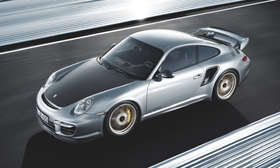 Although it's not the fastest-accelerating 911 of all time, the 911 GT2 RS's performance is still extraordinary. Porsche claims 0 to 100kph (62 mph) in 3.5 seconds (0.2 second faster than the 911 GT2), 0 to 200kph in 9.8 seconds and 0 to 300kph in 28.9 seconds. Top speed is 330kph at redline in sixth gear. A unique chassis setup that includes Porsche Active Suspension Management, with variable damping control, provides added agility. Porsche claims that the 911 GT2 RS lapped the Nurburgring in 7 minutes, 18 seconds--19 seconds quicker than the new 911 Turbo S. That's a time that would give it No. 1 billing among series production cars on standard road tires at the legendary German circuit.